With the summer holidays almost upon us, many of us will be planning a getaway either in this country in abroad. When it comes to Sundays away, there are basically three options when it comes to church, all of which we we’ve tried on occasion. The first approach is to ignore the fact that it’s your normal day to go to church, especially if you’re traveling that day. Why not? There are many other ways to restore your spiritual passion and focus on holiday after all. What a good opportunity to explain to your children that we’re under grace,rather than being ‘graded’ on some sort of spiritual performance chart. There are no brownie points for turning up to a building. The second approach is to visit a church where you are on holiday which can have a few pros and cons. First to the cons. Having attended an English-speaking Anglican church in Germany as an ex-pat, I can tell you that such churches often LOVE visitors attending as it can often swell a small congregation encouragingly. It’s easy to find Anglican churches in Europe using this link or you can just Google “English church in X” to see if there are any English-speaking churches locally. Even in this country however, negotiating a different church culture with your children can be tricky, even without denominational differences. In our own church, Pigwig and Tintin are used to a big city church with lots of high-octane kids’ activities and a high tolerance for noise and children moving around relatively freely. This can be hard to manage in a small traditional country church, say, where some congregants could find their behaviour disruptive, although many older people are delighted to welcome a young family into a church which usually only sees the over sixties cross its threshold on a Sunday. We’ve had some really warm welcomes in various places, even if it was hard to explain to an energetic 4 and 2 year old that they had to sit IN ONE PLACE for an hour! Where there are kids’ groups, it is always worth staying with your child unless you really know the church well. We once took our 3 year old to a Sunday school at another church where the bible story they were studying (in the under 5s group, mind!) was the stoning of Steven, complete with a graphic and grisly story board, apparently drawn by a congregation member!!! 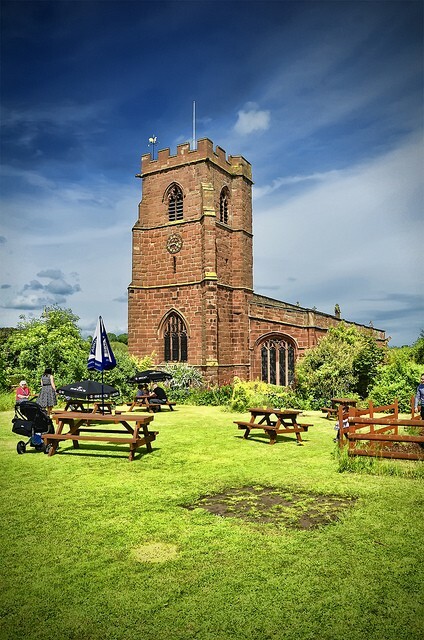 On the other hand, having visited many different churches as a child on holiday in various places, I know that visitors can encourage and delight many congregations, especially if you stay and chat at the end and take some interest in their local situation. Rural churches , in particular, can feel very vulnerable as congregations dwindle and priests are spread across more and more parishes. Visiting other churches can also teach your children much about the unity of the worldwide church, especially if you visit other denominations occasionally. I remember being moved to tears as a teenager in France as I realised the French youth group around me were saying the Lord’s prayer and the sense of being at home with family in the German-speaking church I attended in Germany was a weekly comfort I craved all week long as an 18 year-old gap year student. The final option is to create a little “service” in your holiday accommodation which we have also done and enjoyed. I’ll chat about that next week and suggest some resources and ideas to make it really easy if you like the sound of that. Till then, what approach do you take on holiday with your children?